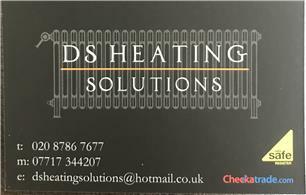 DS Heating Solutions - Central Heating Engineer, Plumber based in Epsom, Surrey. My name is Dominic and I established the company in early 2008. I am fully insured tradesman with a limit of indemnity up to £2,000,000. I am also an accredited member of Gas Safe. I take a great deal of pride in all the work I undertake and strive to leave all my customers 100% happy. I consider myself to be polite and courteous as I feel this is an integral aspect to any business. I am tidy and treat you home or business as if it was my own, and I believe this goes a long way to minimizing the stress whilst on the job. I appreciate the need to work around your schedule as best I can to help the work flow with minimal disruption. Please feel free to also visit my services to see what else I can offer. Please give me a call for a Free No Obligation quote or advice. I look forward to hearing for you, and hope you found visiting my page useful and informative.